The disgusted look quickly formed on Julius Randle’s face. He refused to return any high-fives his teammates offered him. Randle then sat on the bench ready to unload a season-long worth of frustration filled with losses and fluctuating roles. Mostly good vibes may have surrounded the Lakers’ 97-77 win over the Phoenix Suns on Sunday at Staples Center. But Lakers coach Byron Scott admitted he was not happy about reinserting his starters after the Lakers coughed up a 38-point lead late in the fourth quarter. That included Lakers forward Larry Nance Jr entering the game with 4:43 remaining for Randle, who overshadowed his 12 rebounds and three assists with two points on 0-of-4 shooting in 15 minutes. Moments beforehand, Randle had yelled at Lakers guard Marcelo Huertas for not giving him enough looks offensively. That prompted Scott to call Randle out in front of the team afterwards. Once Randle stopped playing, Lakers forward Metta World Peace quickly talked with him on the bench. It did not take long for Randle to show more positive body language. Randle did not speak with reporters afterward. But he has consistently repeated the mantra about “controlling what you can control.” On Sunday morning, Scott also praised D’Angelo Russell and Randle about handling their bench role, saying “the one thing I haven’t seen from one of those guys is them pouting or them worrying about it.” Yet, Randle has often shown frustration on the bench during various stretches of the 2015-16 season. Randle has averaged 11.5 points on 40 percent shooting and 9.9 rebounds through 24.5 minutes as a reserve, while averaging 11.7 points on 43.3 percent shooting and 9.2 rebounds in 28.4 minutes as a starter. 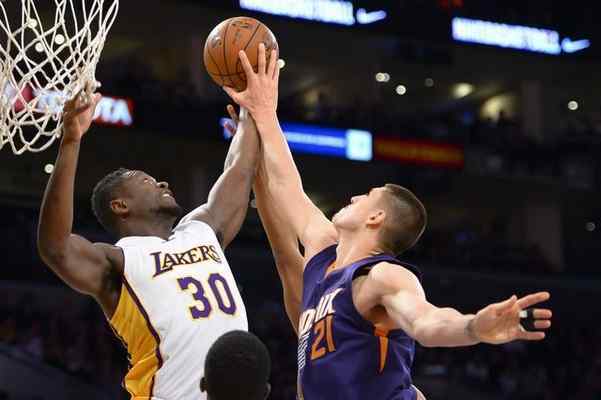 Before Sunday’s off night, Randle had posted double-digit efforts in the previous three games. But Scott has resisted making lineup changes because of the Lakers’ recent winning streak. It also has not helped that Scott has fallen in love with Nance Jr, who posted 15 points on 7-of-10 shooting and 14 rebounds in 32 minutes. More changes might come, such as Randle starting at power forward while Nance Jr. slides over to the small forward spot. But at least until the Lakers (8-27) stop winning, World Peace advised Randle to embrace his role. Scott said he was unaware about World Peace’s intervention. But Scott then gushed that “Metta’s been great in that role” despite sitting out the past 14 games because of a coach’s decision.